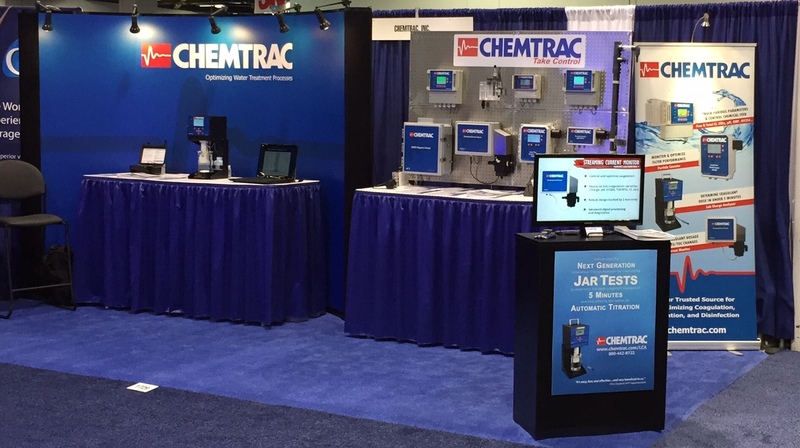 5 Minute Jar Test on Display at ACE15 in Anaheim | Chemtrac, Inc.
For over 25 years Chemtrac has exhibited at the AWWA Annual Conference & Exhibition. This week, at ACE15 in Anaheim, they are introducing the next generation Laboratory Charge Analyzer (LCA), along with the new and improved Benchtop/Portable Particle Counter (PC5000). Of course, on display will also be Chemtrac’s latest models of online Streaming Current Monitors, Particle Counters, Chlorine Analyzers, Organics Monitors, as well as the HydroACT series of water analyzer products. The LCA builds on the success and solid performance of its predecessor models (CCA3100, ECA2100 and ECAT2100), allowing for titrations to be performed in order to accurately determine target coagulant dosages for optimum NTU and TOC removal in surface water treatment. Essentially, the LCA provides a way for conducting jar tests in less than 5 minutes, as opposed to the traditional methods that can take in excess of an hour to run. With the pH measurement option, the LCA can also be used to determine the dosage of other additives such as lime or caustic when used to raise the coagulation pH of low alkalinity waters. And with the auto-titration optional feature, chemical dosing targets can be determined with the push of a button. Chemtrac’s second new product, the PC5000, combines simplicity of operation, advanced electronics, and powerful performance, to set the standard for particle counting. The LCD screen can display eight size ranges, and the analyzer offers a user-friendly calibration process. This highly portable unit has the capability to operate as both a grab sample particle counter (lab or field use), and an online particle counter. This versatility makes it ideal for particle size and concentration analysis in a variety of municipal and industrial applications. With the ability to detect particles at low parts-per-trillion (ppt) concentrations, the PC5000 offers superior analytical performance at an economical price as compared to most other laboratory-type particle counters. So if you are in California for the conference, stop by Booth #1729 to check out the LCA, the PC5000, and all the other Chemtrac products on display.